Happy Friday, everybody!!! Oh my goodness, has it ever been a long week. Normally, I wouldn’t illustrate something this simple for a whole Blob comic, but oh my, do I ever need Friday at 5 o clock to be here! 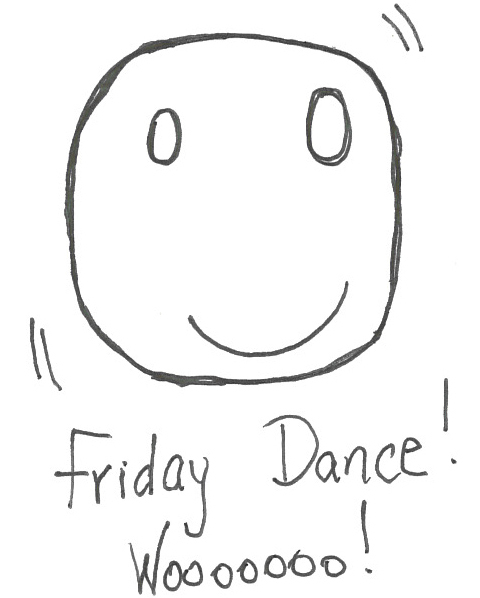 Additionally, there’s something cute about the Blob having a specified Friday dance. I imagine it looking something like a John Travolta dance number. Happy Friday, everyone. Enjoy your day!!! This entry was tagged Arts, celebration, Dance, Friday, good times, healthy-living, illustration, john travolta, oh my goodness, Performing Arts, Salsa, TGIF, The Blob, The weekend. Bookmark the permalink.